Amazon Slashes Resident Evil Biohazard on PS4, Xbox One) to $39.99 Today! 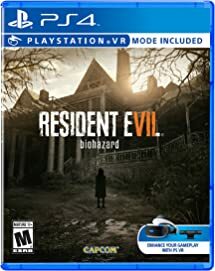 Amazon Gold Box: Resident Evil Biohazard (PS4/Xbox One) – $39.99!!! Bonus: Now through March 3, buy prior Resident Evil films or other eligible titles and receive a a reward code that you can activate for a movie certificate valid toward one admission (up to $5.00 total value when you buy an eligible digital SD, digital HD, or DVD title or $7.50 total value when you buy an eligible Blu-ray title) to see Underworld: Blood Wars beginning January 6, 2017, or Resident Evil: The Final Chapter beginning January 27, 2017, at participating theaters. Previous PostPrevious Amazon Digital Video Game Deals March Sale: Up to 70% Off! Next PostNext Amazon Digital Video Game Deals: March Madness Update (Up to 70% Off)!